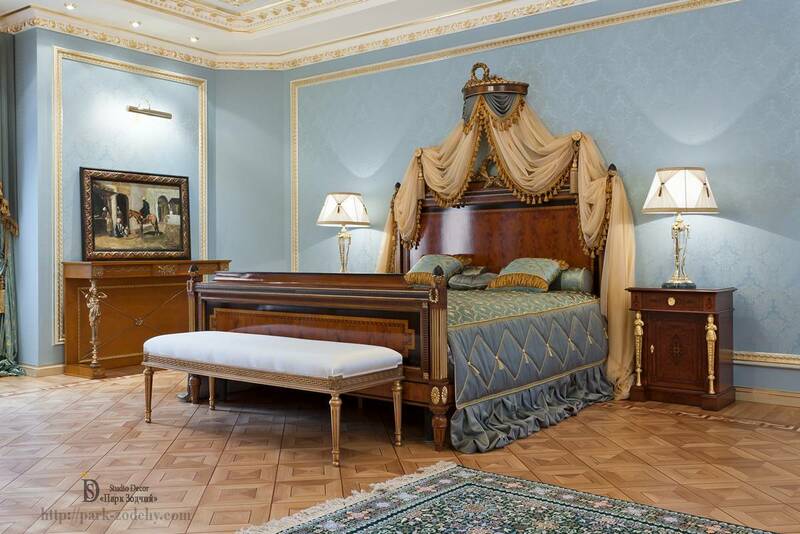 «Imperial» style has given luxury to the bedroom and made it in own way brutal. Classical interior is always out of fashion. The style, which is more than two centuries old, has absorbed some men features: elements of military stuff, clarity of composition, massive items of furniture. Changing values of our world do not affect some unbreakable notions of beauty, luxury, architectural canons. Many of the elements and principles of the décor, which have been used to decorate this bedroom, passed from millennium to millennium and transformed from century to century. That is why they are gorgeous, are classics of the genre and at the same time modern in any era. You can compare them with expensive musical instruments made by the great masters of the past, on which still in our time classical masterpieces are performed. As we have already said, the clear proportions, gilded stucco moldings, hand-made furniture have made the bedroom functional and majestic at the same time. This interior cannot bore, because every detail, piece of furniture and décor are masterpieces. The geometry has been sustained flawlessly: plaster gilded stucco moldings on the walls perfectly outline the shape and size of the furniture. Spanners chandeliers are the hallmarks of this style. They are graciously decorated with ceiling stucco moldings. To make the bed not looking as attachment to the Interior, the size of the canopy is multiple of the square of the main wall mirror. The large carpet separates the relaxation area with silver-gold sofa. The tea drinking corner is outlined by lambrequins, replicating the coattails of the stylized canopy. The diagonal layout of the parquet balances flowing lines of textile. The Interior does not have random decorative details, all is adjusted to the last detail: the legs of tables, the pictures with backlighting, a candlestick, frigate, all is combined in one idea: to create the Imperial luxury in its purest form. And it has been succeeded: as a result, the ideal space of beauty and comfort has been arranged. 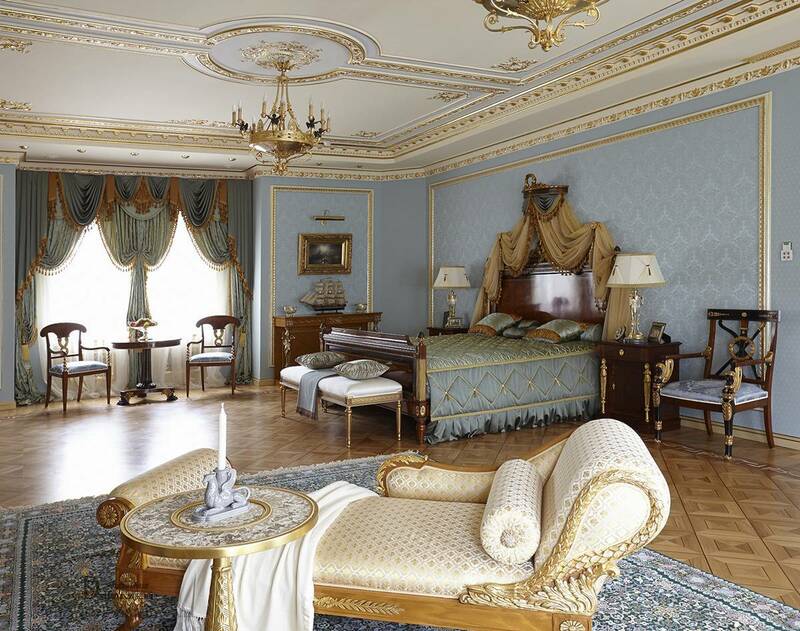 Palace color palette: light blue and silver, gold and beige have made the bedroom exquisitely luxurious. Despite the fact, that there is no rave of saturated colors, the Interior draws the eye. Each piece complements the others. The dark wood material of furniture is balanced by light finishing of the walls, upholstery of the upholstered furniture and exquisite textiles. The designers have used knowledge and respect for the traditions of the architects of the past centuries, so that the Interior would acquire historical uniqueness. The Empire-style bedroom has combined all the basic features of the style. An interesting feature has been brought in by the designers: the perspective projection is developed in such a way that the room looks quite differently from different points. In the end, the Interior has been created, which has combined various techniques of masters of the past and décor elements used by the contemporary masters. It is as if has passed from historical palaces into the present time.